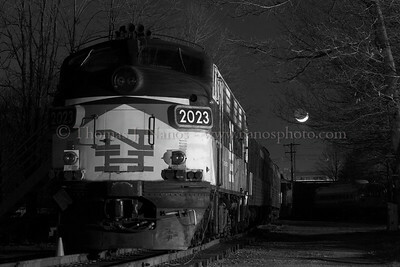 Sleeping Giant A former New Haven EMD FL-9 sits quietly on the grounds of the Connecticut Eastern Railroad Museum in Willimantic, CT as the crescent moon sets in the background. This was taken during a test night shoot. It was the first time I had used studio monolights to light a night scene - this was using two lights - one nearly face on, and the other broadside. Traditionally we had used a portable Lumedyne flash, which was used to evenly light the scene. 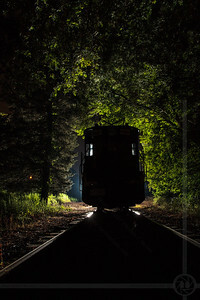 This method enabled the use of shadows to add some depth, and preserve the night "feel"
The Valley Railroad's popular Essex Clipper Dinner Train heads south through Deep River Landing on an early August evening. The train is heading back to Essex where the 2.5 hour dinner service will wrap up, and passengers will return home. 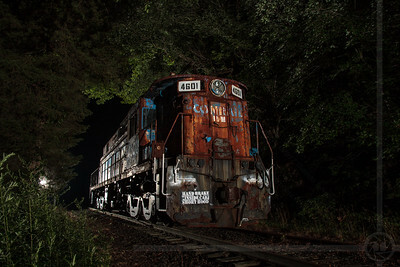 A former Conrail (and former New Haven) E33 sits at the southernmost end of the Valley Railroad in Old Saybrook, Connecticut. 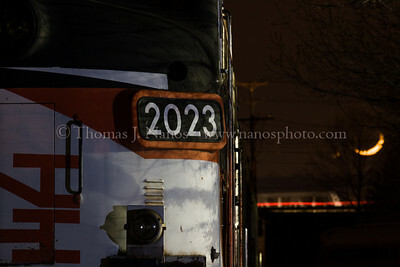 The locomotive will be picked up by the Providence & Worcester Railroad to begin its journey to Altoona, PA and eventually its final home - at the Ilinois Railway Museum. Two Alien Bee B800s for lighting. 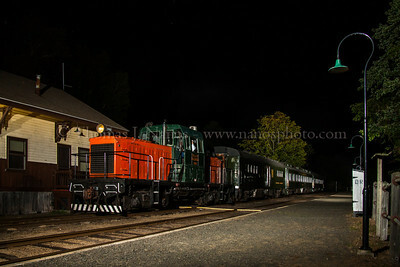 One of the last remaining former Conrail/Penn Central/New Haven/Virginian GE E33 electric freight locomotives waits in Old Saybrook, Connecticut to be picked up by Providence & Worcester train NR-4 the following day. 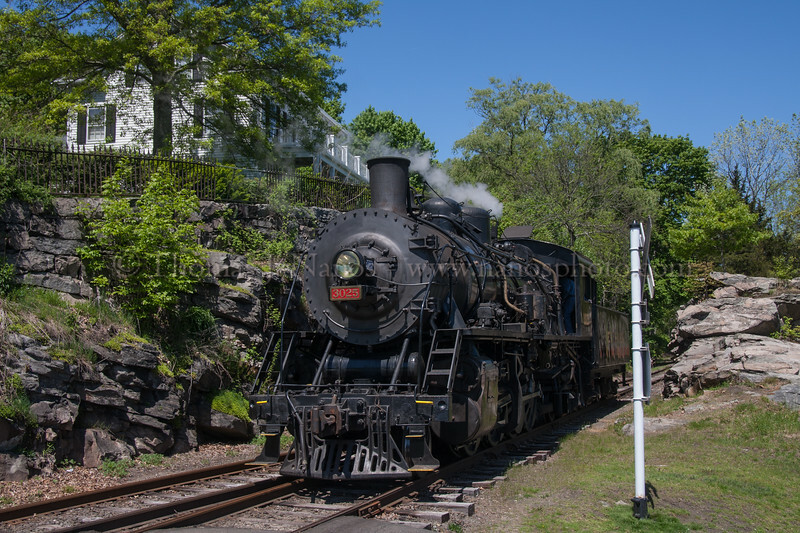 The 6-axle locomotive was once part of the Railroad Museum of New England's collection, but was recently sold to the Illinois Railway museum. 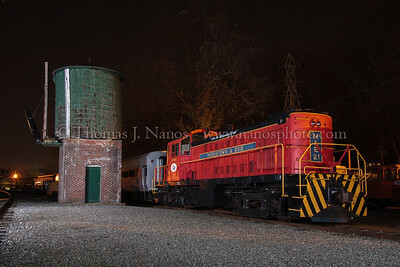 A former New Haven EMD FL-9 sits quietly on the grounds of the Connecticut Eastern Railroad Museum in Willimantic, CT as the crescent moon sets in the background. This was taken during a test night shoot. 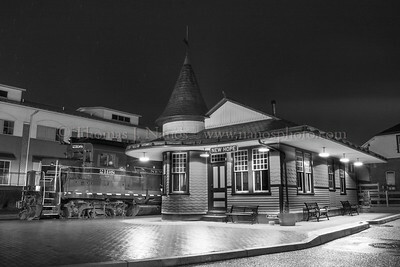 It was the first time I had used studio monolights to light a night scene - this was using two lights - one nearly face on, and the other broadside. Traditionally we had used a portable Lumedyne flash, which was used to evenly light the scene. 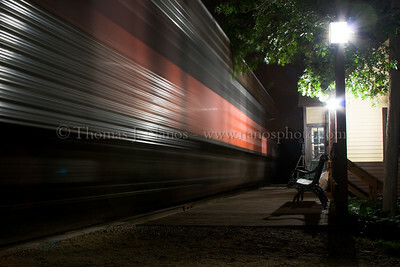 This method enabled the use of shadows to add some depth, and preserve the night "feel"